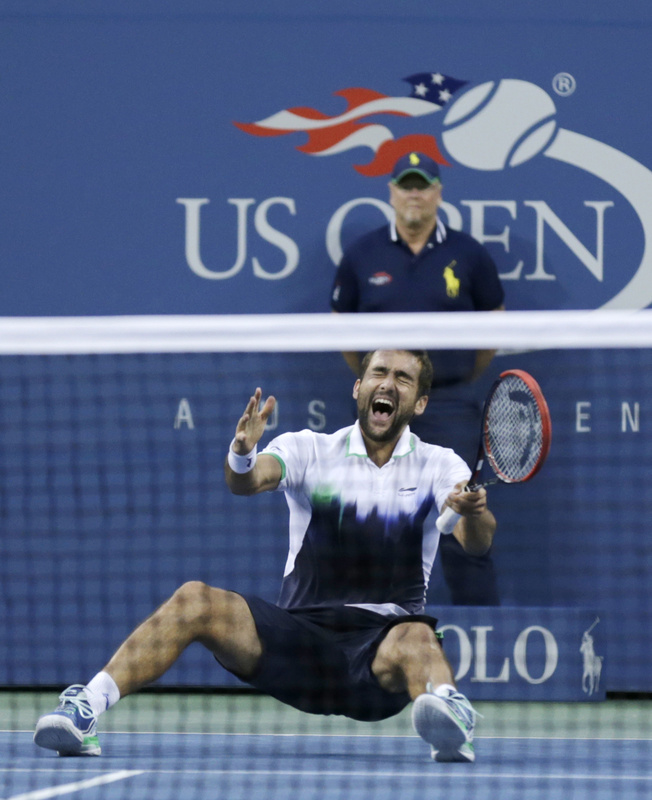 NEW YORK – Unable to play in the U.S. Open a year ago because of a doping suspension, Marin Cilic is now the tournament’s champion. Croatia’s Cilic won his first Grand Slam title by beating Japan’s Kei Nishikori 6-3, 6-3, 6-3 on Monday at Flushing Meadows, using 17 aces – including four in one game – and the same powerful groundstrokes that helped him eliminate Roger Federer in the semifinals. “This is (from) all the hard work in these last several years – and especially this last year,” Cilic said during the on-court ceremony, when he kissed his silver trophy and collected a check for $3 million. The 14th-seeded Cilic prevented the 10th-seeded Nishikori from becoming the first man from Asia to win a major singles title. There hadn’t been a matchup between players making their Grand Slam final debuts at the U.S. Open since 1997. Lopsided and lasting less than two hours, this hardly qualified as a classic. Nishikori stunned No. 1 Novak Djokovic in the semifinals, and this was the first Grand Slam final since the 2005 Australian Open without Djokovic, Federer or Rafael Nadal, who won the U.S. Open in 2013 but is sidelined by a wrist injury. That trio had won 34 of the past 38 major titles, but this was the second of this season that eluded them. Some, including Cilic, had seen Stan Wawrinka’s victory at the Australian Open in January as an indication that the next tier was about to get a crack at the hardware. Twelve months ago, Cilic missed the U.S. Open while serving a four-month ban after testing positive for a stimulant at a tournament in Germany in May 2013. The International Tennis Federation initially sought a two-year punishment, but Cilic wound up with a shortened suspension on appeal. He said he ingested the substance unintentionally via a glucose tablet bought at a pharmacy and calls the process that led to his penalty unfair. Cilic, whose only previous trip as far as the semifinals at a major came at the 2010 Australian Open, used the forced break from competition to improve his game. And that work was on full display the past two weeks – particularly Monday, under thick gray clouds and in a strong breeze. The 6-foot-6 Cilic, who is 25, and the 5-10 Nishikori, 24, each is coached by a guy with a Grand Slam title: 2001 Wimbledon champion Goran Ivanisevic, the last Croatian man to win a major, works with Cilic; 1989 French Open champion Michael Chang is one of Nishikori’s two coaches. “My team has brought something special to me, especially Goran,” Cilic said. “The most important thing that he brought to me was joy in tennis, and always having fun. The Arthur Ashe Stadium artificial lights were on and the stands were mostly empty when the players walked out to the court at 5 p.m. – which was 6 a.m. in Japan, but did not prevent folks there from gathering to watch the popular Nishikori on television. One indication of how far these two men have come: Their two previous U.S. Open meetings were in the second round in 2010, won by Nishikori, and the third round in 2012, won by Cilic. This time, there was never really any intrigue. Cilic won 19 of the last 20 points he served in the opening set, helped by three aces at up to 134 mph. The biggest problem for Nishikori, really, was there were not many extended groundstroke exchanges – and even when there were, he tended to lose them. He was off, whether because of the wind, the accumulated fatigue from a pair of four-hour-plus victories over No. 3 Wawrinka and No. 5 Milos Raonic, or perhaps knowing what was at stake for him, his country and his continent. Cilic wound up with twice as many winners, 38-19. “I guess Kei didn’t feel it today,” said Dante Bottini, who helps Chang coach Nishikori. But good fortune is not all Cilic credited for his career-defining triumph.